Yesterday I discussed the importance of reading labels on laundry detergent and (hopefully) swaying you over to the green-side of things by ditching that conventional detergent! Now that you have the tools of the trade, today we’re going to be going over how to actually wash your clothes in a greener way! Let’s get started, after all reading about doing the laundry is way better than actually doing it, right? The first step towards greening your laundry is to determine the hardness of your water. You can pick up pH strips at your local Lowes that will help you test your water and figure this out. Soap is better for the environment than conventional detergents because it is made of materials found in nature. But, soap can react with the minerals in hard water, leaving a scummy residue on your clothes. If you have soft water, soap flakes will clean your clothes. 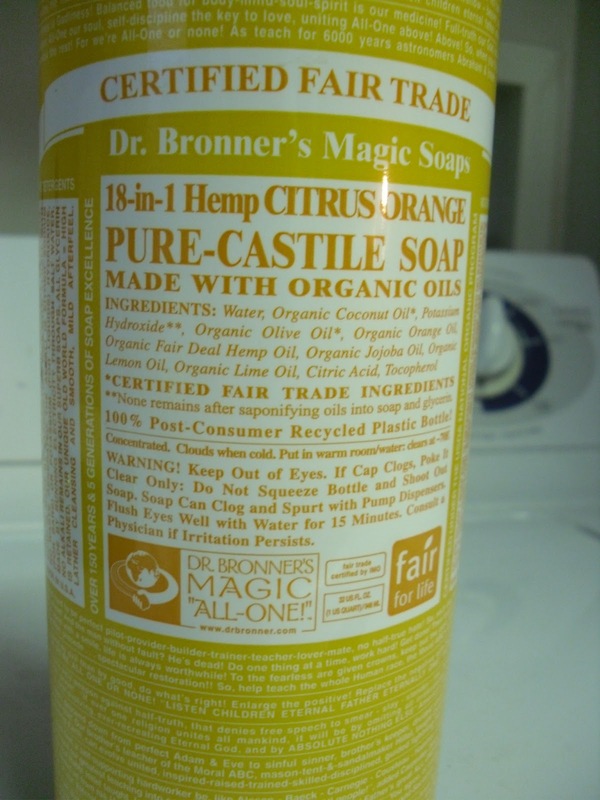 You can also purchase liquid Castile soap (like Dr. Bronner’s) and use about an ounce of soap to an average laundry load. But, if you’re like me and you have hard water, detergent is the way to go. Just make sure (as I mentioned yesterday) you’re choosing a laundry detergent made with renewable materials or sustainable veggie oils. When choosing a washing temperature, remember that the lower the temp, the more detergent you will need. But, water too hot will set stains. Opt for a prewash in cool water with a wash in warm water. While you’re tossing all those other things out, add your usual dryer sheets to the trash. Opt instead for wool dryer balls (like these from LooHoo) which will naturally soften your clothes! I bought plastic ones from Bed Bath and Beyond that work great! One of the hardest thing to launder are those adorable cloth diapers! Let me break it down for you. Next, if your diapers are especially stinky, look for a rise aid or soaking detergent that will cut through that ammonia smell that builds up over time. 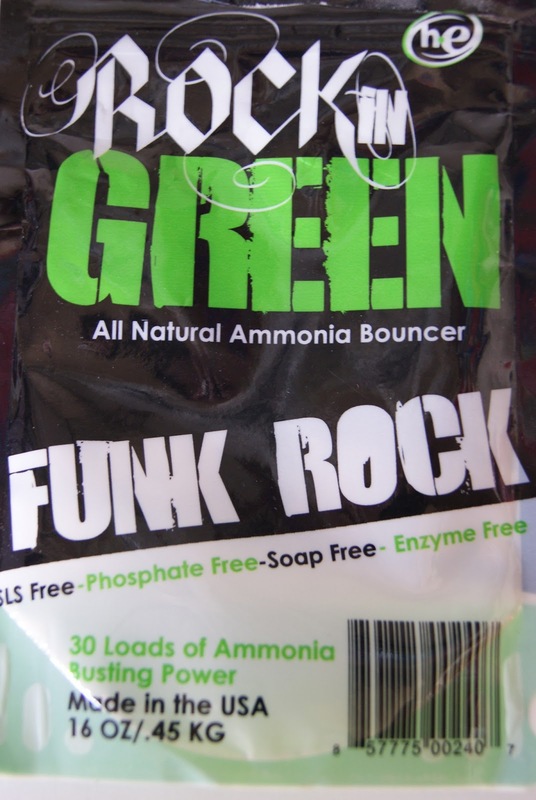 I love Rock in Green’s Funk Rock. I’ve spoken with other cloth diaper Momma’s and many recommend Charlies and EcoSprouts too. Some cloth diaper brands have their own laundry detergents, like BumGenius and FuzziBunz. Next you’ll want to rinse in cold water followed by a wash in warm with a natural detergent. If you have hard water make sure your detergent works well for hard water. You can also use your normal natural detergent with a cap of Calgon to soften the water. 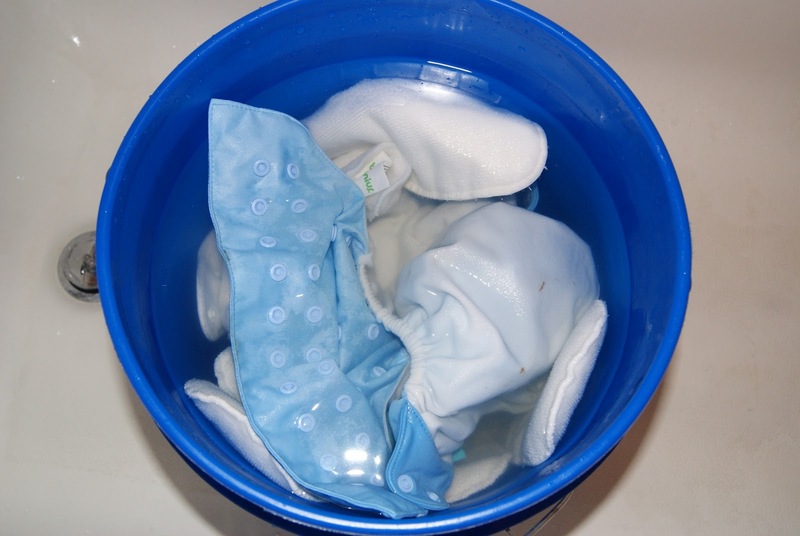 When it comes to diapers, if you are using pocket diapers the inserts can be put in the dryer. You should always air dry the shells so you don’t wear out the water proof liner. If you have stains or stank you can’t seem to shake. Squeeze a little lemon juice on your diapers and let them dry out in the sunlight. The lemon will deodorize and the sun will brighten, all naturally. I don’t know about your neck of the woods but Indiana right now is experiencing second winter so I have a problem putting my clothes out on a line to dry, which is the most eco-friendly way to dry clothes. To make up, I take my folding laundry rack to different areas of our house so they can sit in the tiny ray of sunlight that comes through our windows like a cat. If you live in a town like I do where eco-friendly products are harder to find then a needle in a haystack, look for larger eco-friendly brands like Method, Seventh Generation or you can make your own. All you’ll need is Bar Soap (Unscented, natural), Borax, and Washing Soda (also called Sodium Carbonate or Soda Ash). 2.) In a large bowl, mix 2 parts washing soda, 2 parts Borax, 1 part grated soap. 7.) Use 1/2 – 1 cup per load. So that ends my Laundry series, stay tuned for more green living tips.